I had such a fun time talking about doilies today on Channel 5, here’s a clip if you want to check it out. Do you have any of those doilies that your grandma or great-aunt made by hand? Instead of putting them on the back of a chair or a side table to gather dust, turn them into pieces of art that can be displayed forever. 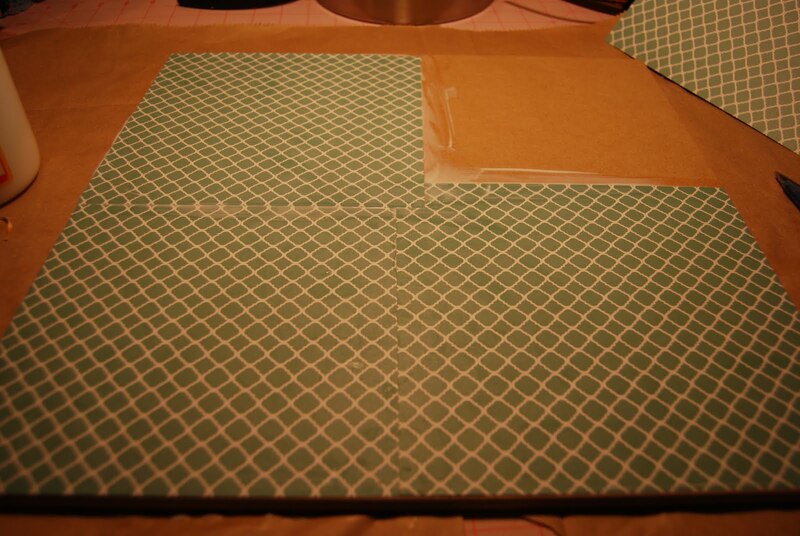 Measure your canvas or board, then cut your scrapbook paper so it fits. Depending on the size of your board, you will probably have to use a few different sheets of paper. Put a layer of mod podge on the back of your scrapbook paper. Then put a layer directly on the canvas or board. Place the paper on the board and smooth it until all of the air bubbles are out. I use the lid from the mod podge to smooth the paper, but you can also use an old credit card or a spatula. Apply the rest of the paper, doing the same thing. Once the paper is on, put a layer of mod podge over the entire board/canvas and let dry. I put a layer of paper over the edges of the canvas too. 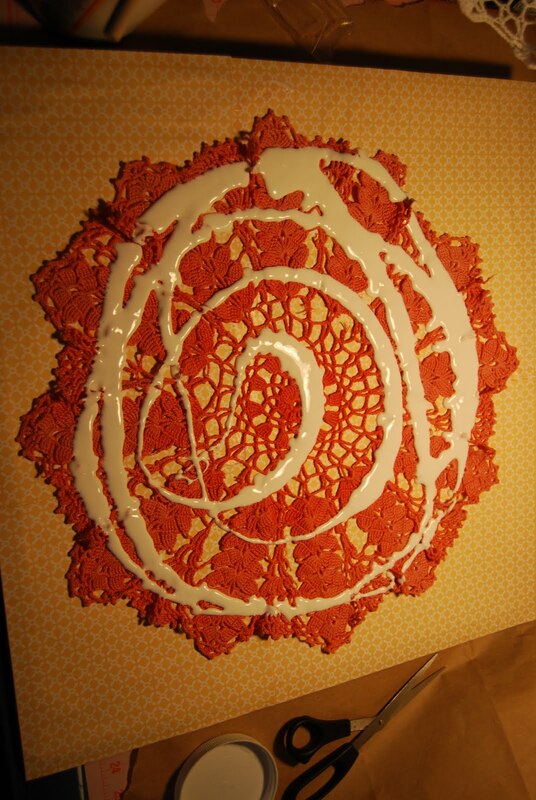 f you are using a colored doily, your doily will change color when it gets saturated with the mod podge. So you want to make sure it is all wet so it is all the same color. Let dry. And now you have those precious doilies preserved forever. I’ll be sharing more doily projects this week! Guest Project — Make a Hanging Fabric Doily Mobile!! Living In France: Scrappy Canvas Frames project! My Mantles are at a Party! This really awesome. I have some of my Moms and Grandmas doilies. I am gonna do this. to preserve and cherish Thank you for sharing with us. Oh, what fun! Congratulations on the segment! Very creative craft project! I've run a doily through my Xyron sticker maker before to put on the front of a fabric-covered scrapbook album. Worked like a dream! Very fun!! They turned out really great! Wow how clever is this? They are gorgeous! 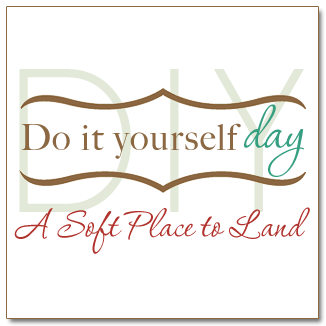 I an so happy you came by and linked this up for the Round Robin..
That is a really sweet idea! What a great modern use for them! Super cute! These certainly aren't yer Gramma's doilies! 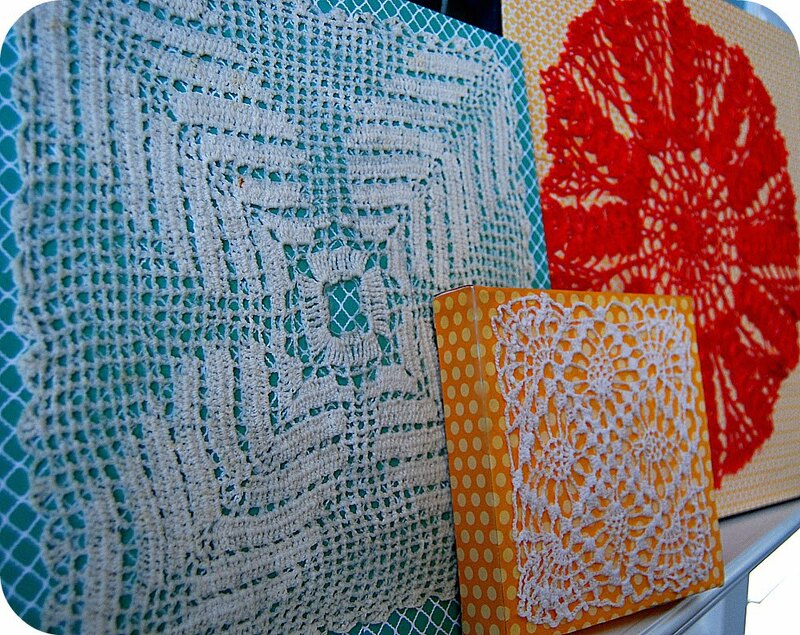 Ooh, I really love this idea BECAUSE I have many of these kind of wonderful doilies my grandma crocheted! What a fantastic idea, Jen! Beautiful! I linked you on my blog. Thank you! What a way to keep such a treasure. You did a fabulous job both on Chanel 5 and with this project. Great idea! I have some that I can do this with. Thanks for stopping by my blog for a visit! Funny that you've posted this! I was just going through back issues of my Martha Stewart Living mags the other day, and there was a big piece on doilies and creating with them and using them in new ways. Jen, you are a real natural! You did such an amazing job and I was so inspired! Way to go, Jen! Your doily projects look great and you look fabulous as always! Congrats on being on Studio 5! How exciting for you! 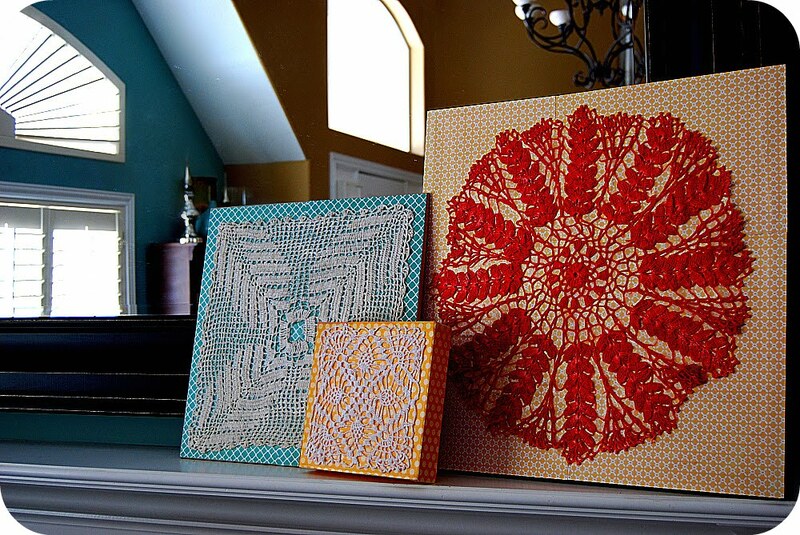 I love these ideas….I received some doilies from my husband's Grandma when she passed. Now I can proudly display them and he can have something of hers to remember out always! COOL! Thank you!!!! I am seriously too obsessed with this!! You are AMAZING!!!!! That's a great idea! I love making doilies, so I'll have to try this. You did great today! You must really be getting more comfortable because you don't look nervous at all. I am sooooo glad that you shared this today! I have two doilies from my Grandma that I just haven't been able to figure out where they should be displayed. This is perfect. I think I even have some canvas, already. Thank you! so, so cute! what a fun project. This is so cute! I actually have 1 or 2 doilies that my hubs grandma made that I dont really know what to do with because while they are pretty they are just not my taste to have on a table or something. This would be perfect! Round Robin is tomorrow if you want to stop by..
That is such a great idea. I may have to be on the look out for some cute doilies. Thanks for the great tutorial! What a FABULOUS idea!! I love the idea of taking something "old" and turning it into something new. Just perfect! These look SO pretty! 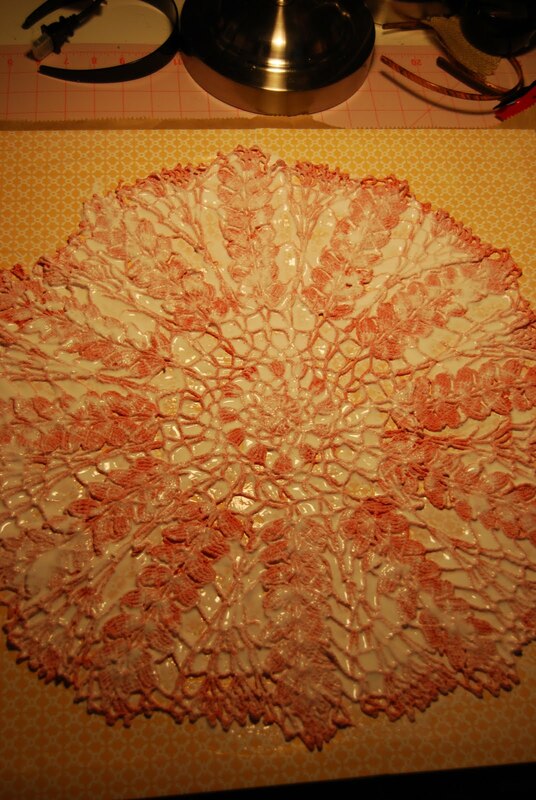 My mom always had a doily with pink in it and I thought it was so pretty. Love the colors and love how it looks "framed". Better than lying flat on a table anyday! 🙂 Glad you had a great time on tv! 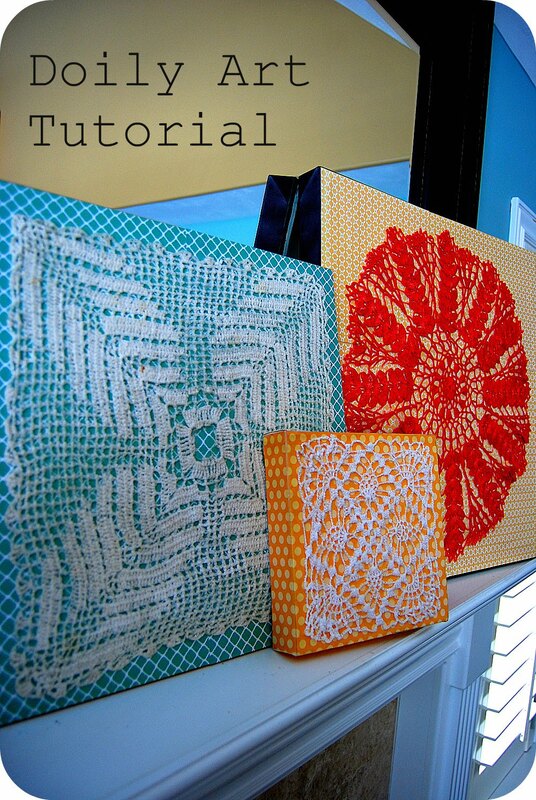 I have a few old doilies that I had no idea what to do with…that's a great use for them though. Thanks! Une super idée, surtout lorsqu'ils sont un peu endommagé, je retiens. I have several of these framed that my grandmother made and also some other thing she made it makes beautiful meaningful art. Love that you like them also. I admit it…I love my doilies. I have them in a couple places. I can't help it, darn it. I like doilies, and I'm not afraid to show it! i watched and was so proud of what a greaqt job you do! OOHoo I am in the presence of someone famous! !